The IKA MTS 2/4 digital microplate shaker is electronically controlled for precise shaking and repeatable results. This plate shaker can accommodate either 2 or 4 microtiter plates at a time. The shaking motion is orbital with a range between 0-1100 RPM and an orbit of 3 mm. This lab shaker has digital controls and a timer up to 99 minutes, or a continuous mode with an audible alarm when the timer is complete. 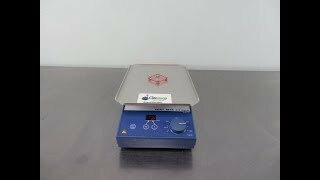 This IKA MTS 2/4 digital microplate shaker has been thoroughly inspected and is performing to expectations. All of our lab equipment comes backed with our standard warranty. Should you have any questions, please don't hesitate to contact us.